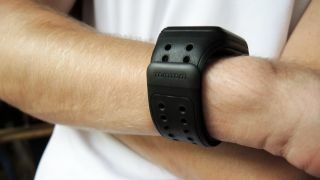 TomTom has just announced the Spark, its new fitness watch with a focus on music. Other than its ability to hold your tunes, there are a number of small improvements to the tech. TomTom co-founder Peter-Frans Pauwels also told me that it will be getting some smarter functionality later in the year. Through a future software update, the TomTom Spark will get call and message notifications. You won't be able to read messages on the watch itself, but it will let you know the ID of whoever is trying to get hold of you. "We don't want to go fully into being a phone replacement," said Pauwels, who hinted that the feature was partly introduced because female clothing often does not include pant pockets - making a notification on the wrist particularly handy. "For guys, notifications are not important because you have them in your pocket. For females, they have it in their bag." Pauwels said that TomTom still does not consider the Spark a "smartwatch", but the introduction of phone notifications will certainly move the watch further in that direction. The bad news, however, is that those of you rocking the older models won't be getting the new feature - it will only be rolling out to the Spark. Sorry about that.